when the weather warms up, i start defaulting to a few key accessories that serve multiple functions throughout the week/weekend. a relaxed, slouchy bag that can hold everything but isn't heavy. comfy flat sandals that can go from day to night. a hat, because there's nothing cooler than a girl wearing a hat strolling down a sunny city sidewalk. and a little scarf that will take the place of a light jacket or cardigan when you're dashing in and out of air-conditioned temperate zones. a note on the balenciaga city: it's a 2007 chevre, which to me in Balenciaga-world equals vintage, as they don't make 'em in chevre anymore! since the new year, i've been doing a gradual edit and sold a few of my bags and found this one second-hand. i was quite skeptical of the Balenciaga city bag several years ago, but now that i have one i've found that it's surprisingly functional (very spacious!) and easy to carry. the chevre leather is much more durable than the current lambskin ones in stores (yes, there IS a big difference). i just sling it over my shoulder and go. no fuss, easy to get in and out of, just great. what are your key accessories for spring? I switch over more to my canvas bags. I love the MB gladiator sandals, they are definitely coming out of my closet soon. Love the blue color of the bag--it's always fun to see different colored city bags! I'm not really an accessories person, but the umbrella/parasol appears to be a must here. I'm personally not much of an umbrella toter--and I'm even less of one when I have to practically wade through a sea of people to get to work (all of them carrying their own umbrellas which bump into mine). Still, people seem to get pretty concerned when I don't carry one and go out of their way to herd me under theirs'. Maybe a black umbrella will be on my to-buy list after all? What are the dimensions of the bag? I've been looking for one and I like the size of yours. Pret a Porter P: nice! canvas is such a summery material. Veuve: i was really surprised by how comfy the MB gladiators are. what color are yours? 0000: haha, that's so funny! is the umbrella a must-have in both rain AND shine? :) you should buck the trend and get a colorful umbrella amidst the sea of black ones! anon: i don't have the info on hand, but all you can get the details at the balenciaga website. Yes! The umbrellas are for rain and shine! Actually, the trend is for colorful umbrellas, but I really don't think a heart-and-glitter pattern will go with my striped shirt! I will be the one black umbrella in a sea of floral umbrellas! Ah, you've inspired me to put on a hat for my walk to the market for a burrito and a browse today. My summer essentials are flat sandals, rayban clubmasters, my saggy brown leather hobo bag, and a chunky cardigan for the northern wind. Love that bag! It's already summer in Delhi - my summer essentials are my Tom Ford sunglasses, sunscreen, my straw hat, a soft grey Belen Echandia satchel and tinted lipbalm. And either Greek or Indian flat sandals. I've been really enjoying everyone's summer posts, it's fun to see wardrobes transit to warmer weather - more colour, lots of sandals. And your bag is beautiful...is it navy? It looks that way in the picture. That's a beautiful bag, lovely colour! 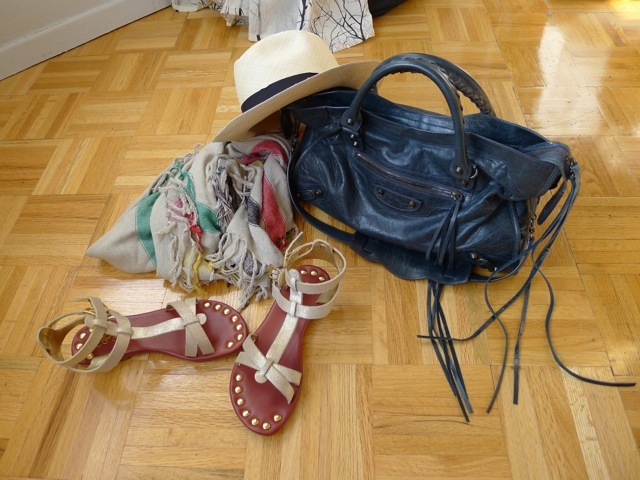 I also find my Isabel Marant scarf to be a great summer essential, perfect for chilly mornings and nights! Kate: your summer picks are great :) clubmasters are so great! i wish they worked on me! Ammu: i'm intrigued by your Indian flat sandals. could you elaborate? i'm assuming your greek flat sandals are of the gladiator variety? lin: even though summer isn't my favorite season, i do love the ease of summer dressing - i tend to wear the same sandals over and over again. the bagi the balenciaga 'anthracite' color, which is a dark grey-ish blue. Garderoben: thank you! :) the IM scarf is really a cool fabric the more i wear it. i've never seen silk woven in this kind of texture! I still have a slight fear of open toe so sandals are a no for me..I stick to my French Sole ballet flats! Love the hat..am on the hunt for a panama myself,where did you get yours? I'm with Pret A Porter P and often switch to canvas in the Summer months but I do love my large Alexa..purely so I can fit everything in! That bag looks so good - perfect shade of navy! I've been considering getting a panama hat for spring/summer. Those sandals are gorgeous! I wish I could do ankle straps, but they are so unflattering on me! My Yuli scarf has also become a spring essential. My other spring essentials would be ballet flats or moccasins and clogs paired with dresses. My lightweight cardigans (in cotton or merino) have also been in constant rotation. And this is the shop/stall where I bought mine, in Hermes orange and black. Milly: the panama hat is from jcrew when they featured original Panana hats at their boutiques. your large Alexa bag sounds great- what color is it? Ginta: thanks! i like how the color looks different in different lighting :) ballet flats are so carefree - i wish they were more practical for city walking though. jennifer: aww - well i think the color of strappy sandals makes a difference too. i think my Yuli scarf is second to my IM dicker boots as my best purchases of the season! Ammu: the Kolhapuris sound so cool! reminds me a little of the Jack Rogers slides that are so popular here. a comfy and stylish flat sandal is worth its weight in gold! yay for the Balenciaga! the fringe of that bag is just perfect. I stuff mine with a lot of things including my laptop and it holds up well. I'm planning on using my straw fedora hat this summer, too, hoping to pair it with linen shorts and sandals. Nanashi: yours sounds perfect too - is it the city style, or a larger part-time or work? i can never get enough of linen and natural breezy fabrics in summer. I love your bag! Now you've got me thinking Balenciaga all over again! V: thanks! ebay and various other legit resellers are great places to find pre-2008 balenciaga. my balenciaga city is definitely going to be my bag for travel too. lightweight and just roomy enough. I haven't tried any nail polish colors as of late, but I'm definitely thinking bright colors will definitely make my winter-turned-spring-turned summer look (just subtract peacoat and add shorts) a little bit more 'summer'-looking. I've been dying to try something truly neon! Your toes look great, btw--and I love your hat. I've seen quite a few hats here, but they've all been so low quality that I haven't had the heart to buy them. I feel like quality is so apparent when it comes to hats, and it's impossible to just 'buy a cheap hat' without it really showing! 0000: thanks dear! :) jcrew started carrying some 'original heritage' labels last summer and this old school Panama hat is one of them. they're not that expensive either and i think there are many online shops where you can get quality millinery :) you should totally do neon nails - i am a big big advocate of getting all sorts of crazy colors on manis and pedis - it's like a temporary tattoo!